“	That’s fine. Nobody’s gonna cry over my grave anyway. Douglas Cartland is a major supporting character in Silent Hill 3. He is a middle aged private detective who was hired by Claudia Wolf, the Silent Hill cult leader, to locate Heather Mason and return her to Silent Hill. He is voiced by Richard Grosse, who passed away before the game was released. Douglas has gray hair and wears a brown coat with pants. Because of his age, his hair is thinning and he combs his hair back to hide it. Once Heather encounters him in her apartment, he is seen no longer wearing his hat. Douglas’ original motive was to return Heather to Claudia, but when Douglas learns the truth about Heather’s kidnapping, he supports Heather throughout the rest of the game. Douglas talks to Heather Mason after she finishes her phone conversation with her father at the Central Square Shopping Center. Douglas requests for some of Heather’s time, and Heather clearly states that she isn’t interested. Douglas states that it’s about Heather’s birth, which still isn’t good enough to interest her. He follows Heather but can only go so far, as she enters the bathroom. Douglas, waiting in the shopping mall’s lobby, finds Heather after she kills the Split Worm. He reveals that he has also encountered a monster, but Heather interrupts him. She accuses Douglas of being in on it with Claudia, but realizes that Douglas is just as shocked as she is. Heather decides to head home using the subway. In the Daisy Villa Apartments, Douglas discovers Harry Mason’s corpse. Douglas calms Heather down and they lay him in bed. Douglas states that he feels responsible and offers to take Heather to Silent Hill to murder Claudia in retaliation for Harry’s death. When Heather tells Douglas he might die, he replies “That’s fine. Nobody’s going to cry over my grave anyway.” He then heads out to get his car ready. Outside the apartment building, Douglas greets Heather, and reveals that Vincent Smith gave him a map and told him to go look for Leonard Wolf upon arriving in Silent Hill. Douglas gives Heather the map and Harry’s notebook as they get in the car. During the car ride, Douglas and Heather discuss the rumors of Silent Hill, and Heather’s past as Alessa Gillespie. Heather also recaps the events of the first Silent Hill. Douglas mentions he went to Silent Hill once on a missing person’s case, which may possibly be a reference to James Sunderland from Silent Hill 2. Douglas sits silently in the car, listening to Heather’s feelings about her father’s death. When they arrive in Silent Hill, Douglas and Heather stop at Jacks Inn. They briefly discuss being afraid to be alone; Douglas admits to being afraid, and then heads for Leonard Wolf’s house. Eventually, Douglas returns to the Inn before Heather comes back from Brookhaven Hospital. Douglas leaves a message for Vincent to tell Heather to head to the Lakeside Amusement Park, where Claudia apparently is. At the amusement park, Douglas speaks with Claudia and becomes angry that she deceived him. Claudia once again explains her whole plot, and Douglas, like everyone else, disagrees and mocks her. Douglas then raises his gun to Claudia, who challenges his readiness to kill her. At this point, Douglas admits that he has done it before, to which Claudia remarks pity on him as the cut-scene ends. Whatever happens after the cut-scene leaves Douglas badly injured, to the point he feels his leg may be broken. It may be possible that supernatural powers possessed by Claudia came into play here, but is more likely that she ordered monsters to attack him. When Heather arrives at the amusement park, she discovers that Douglas’ leg is broken. Douglas tells Heather she reminds him of his late son. He also tells Heather, as she leaves to confront Claudia, that perhaps if he killed her instead, his nightmare would end. Heather, nervous, doesn’t feel offended, and takes a deep sigh before she continues on her way. In the ‘normal’ ending, after Heather kills the God, she pretends to be possessed and startles Douglas before nearly stabbing him. Douglas says Heather has bad taste in jokes, but Heather interrupts, telling Douglas to call her Cheryl. In the ‘possessed’ ending, Douglas is killed by Heather. This ending can only be unlocked after completing the game once. In Silent Hill 3, seventeen years after the events of the first Silent Hill game, Alessa’s reincarnation, Heather, is approached by Claudia Wolf who is now a priestess of the Order. Claudia intends to bring about the descent of the cult’s God to usher in Paradise; for this to happen Heather must remember her “true self” (Alessa). To nourish the growing fetus within her with hatred and also seventeen years of revenge for taking Heather/Alessa away, Claudia has Harry murdered. During the game, Heather slowly regains her memories of being Alessa. A memory of Alessa, a dark emotion mimicking her likeness, is encountered by Heather in Silent Hill’s Lakeside Amusement Park. The Memory of Alessa attacks Heather as a boss enemy, intent on ending Heather’s life herself to spare her and everyone from further pain after the God is born. Heather then enters Nowhere, and revisits several of Alessa’s memories from the past. In a confrontation with Claudia, Heather swallows a tablet of Aglaophotis given to her by her father, causing her to vomit it out of her body. Claudia, in desperation, devours its remains to birth the God herself. Being born of Claudia’s womb, the God personifies her vision of what God would look like, and therefore vaguely resembles Alessa. Heather survives the ordeal, and it can be presumed she lives a happy life afterwards. After Harry raised Heather in the unnamed town for 12 years, the events of Silent Hill 3 take place. Because the game takes place 17 years after the events of the original Silent Hill, Harry is now 49. When she returns home, Heather discovers her father slumped in a chair, having been brutally murdered by the Missionary under Claudia Wolf’s orders. Heather gasps at the sight and sobs uncontrollably, saddened by the sudden loss. After defeating the Missionary by herself, Douglas Cartland helps Heather move her father’s body into his bedroom and covers him with a sheet with lilies. Heather decides to kill Claudia in revenge for her father’s death, who is waiting in Silent Hill. Before their car ride to Silent Hill, Douglas gives Heather a postmortem notebook from Harry. The notebook details Harry’s experiences from the first Silent Hill game and is a final goodbye to his daughter. Heather wonders if her father would be mad at her decision if he were still alive and promises to return home. After defeating God, Heather mourns over her father’s death one last time. Just as she is ready to leave, Heather looks behind her at what is unseen by the player, which may have been Harry’s presence. At the end of the game, when Douglas calls Heather by her name, Heather states that she isn’t hiding anymore and wants to be called Cheryl, the name her father originally gave her. The game closes on an image of Heather putting flowers next to Harry’s grave. In Silent Hill 3’s UFO ending, Heather returns home to find that Harry is not dead, and tells him about her hardships. Infuriated, Harry obliterates the town of Silent Hill with the help of aliens. Listen, suffering is a fact of life. Either you learn how to deal with that or you go under. You can stay in your own little dream world, but you can’t keep hurting other people! Cheryl “Heather” Mason is the protagonist of Silent Hill 3. She is the first female primary character in the Silent Hill series. Heather is the reincarnation of both Cheryl Mason and Alessa Gillespie. In early promotions and the back of the game’s cover, she was given the name “Heather Morris,” the name of her voice actress. Heather’s real name is Cheryl Mason, the adopted daughter of the writer Harry Mason, who survived the events of the first Silent Hill game. When Harry escaped Silent Hill, Alessa/the Incubator came back as an apparition and presented him with a newborn baby, which is both Cheryl, and Alessa herself, restored to one body again. Harry left Silent Hill with the baby and moved to Portland, however, they were attacked by a cult member there and Harry killed him in self-defense. In an attempt to throw the cult off – should they come and look for both him and the child – he renamed her Heather, dyed her hair blonde and relocated to another city. Harry eventually settled in the Daisy Villa Apartments with Heather. On one of Heather’s birthdays, Harry gave her a pendant with a red jewel inside and told her to take good care of it and to never take it off; the reason being that the red jewel is crystallized Aglaophotis which can expel demons and if the Order had ever attempted to impregnate Heather again, she could survive by swallowing the Aglaophotis and expelling God. Official sources describe Heather as a “normal, carefree girl who loves to shop.” When it comes to her personality traits within the game itself, one very obvious trait of Heather is that she is moody and loses her temper quite easily at things that frustrate her; these are considered normal traits for a teenager. Heather can also be very sarcastic and humorous (for example, her “joke” to Douglas in the normal ending). Because of her sarcastic streak, she adapts rather remarkably to the disturbing spectacles she comes across on her journey. She even specifically states in the game that this nightmare has numbed her. Her bravery and nonchalant reaction to various creatures and horrors late in the game, forged by her resolve later all point to a rather hot-headed temperament in comparison to the other protagonists in the Silent Hill series. Heather has a great love for her father as he raised her on his own. It is no surprise she jumps to Harry’s defense when Vincent Smith criticizes him. When Harry dies, she is completely distraught, and begins to turn to Douglas Cartland as a father surrogate, since she feels that he is the only one she can trust, in contrast to Vincent and Claudia Wolf. They develop a father-daughter bond on account of their losses (Heather’s father and Douglas’ son, as he confesses later on). Douglas even comes to compare her to his dead son, to which Heather (visibly moved) replies “Well, maybe if you’d compared me to your daughter…”. Their bond grows on their way to Silent Hill and later on after she finds an injured Douglas at the Lakeside Amusement Park. Heather starts the game out with a switchblade as her starting weapon, which when inspected Heather comments that she “likes to carry it around for some reason”. She also owns a stun gun, a gift from her “worrywart dad”. In the subway, an article on the paranormal can be read on the ground. When Heather inspects it, she states that she used to love reading the said publication and “spooky” stories for fun, implying a fascination with the paranormal. She also seems vaguely interested in literature – she references William Shakespeare and Edgar Allan Poe, and can quote Macbeth. At one point in the game, Heather will refuse to pick up a pack of cigarettes, saying that she “quit for good”, which implies she used to smoke but gave it up. As the game progresses, it is implied that Alessa’s original personality traits and memories surface in Heather. It is also notable that Heather is a lot more “human” when inspecting items in her inventory. She does not give perfect, detailed descriptions like some other characters, instead, she describes them as much as many others normally would. One day, while running an errand for her adoptive father at the Central Square Shopping Center, Heather accidentally falls asleep and dreams about Silent Hill. She finds herself wandering through the nightmare version of Lakeside Amusement Park. While she is walking along tracks she is run over by a roller coaster. When she awakens from the nightmare, she exits the burger joint and calls her father, letting him know that she is on her way home. However, when Heather is about to leave the mall, a man named Douglas Cartland attempts to talk to her about her “birth.” Heather, thinking Douglas a stalker, walks away from him and exits the shopping mall through a bathroom window to avoid confrontation with Douglas. However, the alley past the window is blocked and she is forced to enter the shopping mall again through the employee’s area. Heather comes across a monster and manages to kill it with a handgun, shaken by this since she knows that monsters don’t exist. As Heather wanders through the monster infested mall, she encounters a barefoot woman dressed in all black with flowing platinum blonde hair who reveals herself as Claudia Wolf. Claudia tells her about a paradise created by God and Heather’s “true” self. Heather is confused and comes down with a serious migraine, as if she was trying to remember something from long ago as Claudia departs. While descending an elevator, Heather soon plunges into the Otherworld shopping mall. She tries to convince herself that everything is just a dream. By defeating the Split Worm in the core of the mall, the mall changes back to normal. Heather decides to use the subway to get home, but as she walks through the mall, she meets Douglas again. Heather accuses Douglas of being on Claudia’s side, but he tells her that he was only hired to find her and that he has no idea what is happening. Heather accepts Douglas’ words, and faintly remembers that she forgot something important. She shakes off a strange feeling and tells Douglas she is heading home. After exploring a subway, an underground passageway, sewers, and a construction site, Heather finds a way into the Hilltop Center. While inspecting a bathtub, Heather suddenly enters the nightmare world once again and falls unconscious. Just before coming to, Heather hears her father’s voice in her mind. After the transition, Heather kicks the bathtub in frustration and yells, “Did Claudia do this too!?”. Heather soon encounters a man named Vincent Smith, who is also a member of the same cult as Claudia, but who has different views on where the cult should go. Vincent confirms that Heather has a forgotten past and calls Heather’s father a “sneaky guy” and Heather yells, “Don’t talk about my dad like that!” at Vincent. Before leaving, Heather voices her disbelief about Vincent not being on Claudia’s side. Heather eventually finds a way out of the Hilltop Center and upon entering her apartment, she discovers her father brutally murdered, his lifeless body slumped in a chair. Heather, shocked and speechless, rests on her father’s lap and sobs heavily. Once she regains her emotions, Heather follows a blood trail to the apartment’s rooftop, where Claudia is waiting for her. Heather demands an answer from Claudia as to why she killed him, and Claudia answers revenge for seventeen years and to fill Heather’s heart with hatred. Claudia locks Heather on the apartment rooftop and after a boss battle, Heather returns to her apartment where Douglas is waiting for her. Despite Douglas’ apologies, Heather yells at Douglas furiously and blames everything that has happened on him. Once Heather is settled down, Douglas helps her move Harry’s body into his room, covering him with a white sheet and lilies. Heather decides to find Claudia and kill her in revenge, even though Douglas doesn’t agree. Douglas offers to drive her to Silent Hill since he is also responsible for Heather’s loss, and she eventually agrees. Heather sighs heavily, and pays her final respects to her father before departing. Douglas gives Heather a map of Silent Hill and a notebook that her father was holding. Upon reading the notebook, Heather learns that her father wrote it in order to tell her the truth about what happened seventeen years ago. During the car ride to Silent Hill, Heather sits silently in the passenger seat while Douglas tries to make conversation with her. Heather, with the notebook in her lap, tells Douglas about Alessa Gillespie, Dahlia Gillespie’s failed attempt at birthing God using her own daughter, and her own birth. Heather then takes a moment to tell her father that she never had a chance to tell him about the happiness that he gave her. In Silent Hill at Jacks Inn, Douglas tells Heather to meet him once she explores Brookhaven Hospital. While searching the hospital, Heather is phoned by Leonard Wolf, Claudia’s father, resentful of his own daughter and willing to help Heather stop her. However, upon the two meeting, Leonard becomes hostile to Heather when he realizes she is not a member of the Order. Heather kills Leonard and takes the Seal of Metatron with her. Upon returning to Jacks Inn, she meets Vincent once more, who tells her to go look for Douglas at the Lakeside Amusement Park. As she explores it, Heather re-lives her initial nightmare, only this time she jumps off the tracks in time to avoid the incoming roller coaster. She then finds Douglas, wounded from a confrontation with Claudia. Having bonded with him, Heather tells him to hang in there as she goes off to look for Claudia. In the amusement park’s carousel, Heather is confronted by the Memory of Alessa, who attacks her with various weapons in an attempt to stop the birth of God. Heather beats her and she vanishes, allowing Heather to make her way to the chapel. In The Chapel, Heather meets Claudia and Vincent once more. Vincent urges her to kill Claudia, whereupon Claudia stabs him twice, killing him, telling Heather that the Seal of Metatron will not prevent the birth of God. Heather ingests the Aglaophotis inside her pendant, which promptly makes her vomit out the unborn God fetus; however, Claudia ingests it and gives birth to it, which brings about her demise. Heatherrabbit then confronts the partially-formed God, killing Her. There are three possible endings. The first play-through gives out the Normal ending, whereupon Heather goes back to Douglas, who is alive, and comes to terms with her past and ostensibly returns to her normal life. Second play-throughs can result (depending on certain requirements) in either the Possessed ending, where Heather murders Douglas and stares at his body, having been possessed, or a joke UFO Ending, where Harry is still alive and commands aliens to destroy Silent Hill. Because a memo in Silent Hill: Homecoming states that Douglas Cartland exposed the Order, the Normal ending can be considered canon. Robbie the Rabbit is an anthropomorphic rabbit doll that has made appearances in many of the Silent Hill games. In some of his appearances, his mouth is covered with blood. 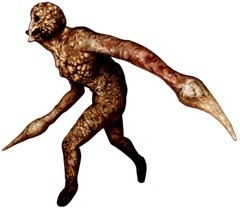 For the most part, his appearance seems to serve little more than to provide an ambiguous level of unease to the player, due to the odd nature of his existence within the world of Silent Hill, his bright colors compared to the rust brown and dark red of everything else, and his recurring cameos. Most fans believe him to be sentient and believe that he is “watching” the player. This theory is not completely unfounded; the sight of Robbie staring at one is enough to unnerve any player. Robbie’s character could be seen either as an in-joke, a homage to the many horror films that depict bloodied rabbits as nightmarish killers, or it could even be an element of the town itself. An allusion to Silent Hill’s dark sense of humor would be fitting as many of the game’s plots involve the town’s children in some aspect. It’s possible he is simply there as a plot device to help tie each game together in a small, yet memorable way. Robbie’s first appearance is in Silent Hill 3, where he is revealed to be a mascot for the Lakeside Amusement Park. Large models, possibly costumes, of Robbie can be found slumped in various areas of the park as if dead. It isn’t quite clear whether or not there is a person, alive or dead, inside, or if the mascot is sentient. Robbie’s ‘corpse’ can be seen many times while exploring the amusement park and he can also be seen as a doll in the souvenir store. Examining the tourist information scattered throughout the amusement park reveals that Robbie is one of its four animal mascots, along with Kathy the Kitty, Huey the Horse and Dawn the Duck. Heather Mason can also unlock a Robbie t-shirt to wear. He also appears as the icon for the game’s save file on a PlayStation 2 memory card, which shows him running, or, perhaps more appropriately, chasing. “	What you call “faith” is nothing more than a child crying out for love. Vincent Smith is one of the central characters from Silent Hill 3. Although Vincent is a priest of the Order, he takes a rather atypical stance on the subject of God. Vincent is a priest of the Order. He manages its finances, has had a chief hand in building the Church. However, Vincent also uses the Order for his own personal benefit. It’s also implied that he spends the donations from some followers on himself. On his and Heather Mason’s first meeting he claims to “know everything” about her past, the situation at hand, and the events that happened in Silent Hill 17 years prior to Silent Hill 3. Vincent then mentions Heather’s “mother” (Dahlia Gillespie) and her adoptive father Harry Mason. The Book of Lost Memories reveals Vincent’s age is about 25, so if this is the case, he would have been somewhere around the age of 8 by the time of Silent Hill. By listening to the tape in the Chapel area, it can be speculated that when Vincent took the interview from the unknown cult member, he also learned about all of the events that happened in Silent Hill (other than God not being born properly). Other than that, not much is known about him, or his past, but it can be speculated that Vincent was raised alongside Claudia Wolf. This can be evidenced by the fact that Vincent mentions seeing (possibly as a child) Claudia being abused by her father: Leonard Wolf. He says that Leonard’s “cruel” acts have been “burned into [his] mind”. Vincent is described as a “hypocrite behind nice clothes and a neat appearance” by Shingo Yuri. Vincent is often manipulative, smug, and makes malicious “jokes.” He likes to tease Heather by revealing bits of his knowledge, while at the same time unwilling to answer all of her questions and relishing that power. Vincent appears simultaneously manipulative and flirtatious in his encounters with Claudia Wolf and Heather Mason, making stinging personal comments and flippantly joking about his religion and the Otherworld (both of which he is actually serious about). Despite his rather grating personality, he is quite sane and has a strong interest in helping Heather prevent God from being birthed. Heather has the impression that Vincent is crazy and is on Claudia’s side, but her misjudgment of his character serves Vincent well; he wants both Claudia and Heather out of the way. Based on Vincent’s conversation in the library, it is clear that he hates Claudia, but during his and Claudia’s conversation at Jack’s Inn, he sounds uncharacteristically sympathetic (or perhaps mockingly so) toward her abusive childhood. Because of this, it can be speculated that he feels for Claudia and her loneliness, but hates her for her fanaticism. While he and Claudia both believe in God, they both have drastically different views on what God is, and if she can bring eternal Paradise. For his part, Vincent is grounded in financial concerns and has no intention of creating any paradise. He states that the birth of God wouldn’t be “convenient”. Heather first encounters Vincent in the Green Ridge Mental Health Clinic of the alternate Hilltop Center, where he is apparently reading. Vincent reveals to Heather that he knows about Harry Mason and Dahlia Gillespie. He claims that he is on Heather’s side and not Claudia’s, saying that he thinks that she was “totally brainwashed”. His flippant behavior towards the Otherworld, however, makes Heather think the opposite. Despite this, throughout the game, the player must rely on Vincent’s advice to reach the end. For example, after Harry’s death, Vincent (through the cooperation of detective Douglas Cartland) urges Heather to go to Leonard Wolf (when heading to Silent Hill) and retrieve the Seal of Metatron, which he mistakenly believes will repel the God. In his next appearance, Vincent is arguing with Claudia in the Jack’s Inn motel, on the subject of God. He tries to convince her that her faith and intention to birth God and create paradise are a result of an abusive childhood, revealing that he saw her father abusing her, but Claudia claims that everyone, including Vincent, doesn’t understand anything. When Heather returns to Jack’s Inn, Vincent tells her a supposed message from Douglas that Claudia is at the Chapel, across Toluca Lake. In the chapel’s library, Vincent greets Heather, who is irritated by his appearance. Heather questions why Vincent is helping her and Vincent replies that it’s because he truly is on Heather’s side. He also reveals that he does not feel like stopping God’s birth himself, thinking that its birth would not be “convenient” and “unpredictable”. Heather becomes angered at Vincent for using her and a battle of wits begins. Vincent wins by making a cruel joke regarding the monsters (which for a moment makes Heather think that she was killing human beings). In the end, Heather realizes that she shares the same motive with him. He asks her if she has retrieved the Seal of Metatron from Leonard and once Heather shows it to him, Vincent provides her a book which contains important information about it, before leaving. Towards the end of the game, Vincent is found in the church’s core, arguing with Claudia, again, on the subject of God. Claudia starts to threaten Vincent to stay out of her way, and he mockingly and/or jokingly asks her if she is going to kill him otherwise. After Heather interrupts the conversation, Vincent turns from Claudia and lets Heather kill her. This becomes a last straw for Claudia and she takes this opportunity to stab him in the back with a dagger, and Vincent falls to the floor and remains quiet for some time while dying. Through his breath, Vincent eventually tells Heather to unleash the Seal of Metatron, but his hope is crushed when it is clear the seal has no effect this time. Disappointed to see that Vincent fell for her father’s beliefs, Claudia stabs him once more, this time in the chest and leaves the dagger embedded in him, killing him for good. Upon examining Vincent’s body, Heather states that even though she hated Vincent, she felt that he did not deserve to die. After a subsequent cutscene before the final boss fight, Vincent’s body has mysteriously disappeared from the room. It is most likely that this was just a minor error. “	They’ve come to witness the Beginning. The rebirth of Paradise, despoiled by mankind. —Claudia to Heather, regarding the monsters. Claudia Wolf is a character from Silent Hill 3. Although she is considered to be the primary antagonist, she is not a completely evil character, just a religious follower. Claudia’s voice actor, Donna Burke, had previously voiced Angela Orosco from Silent 2. “	You hated your father, didn’t you? I saw the way he hit you… kicked you… and made you cry. The memory of his cruelty is forever burned into my mind. Claudia is a mysterious woman who appears frequently in Silent Hill 3, clad in black. While she is one of the key antagonists of the game, not much is revealed of her past. It is clear that she is a firm believer in the doctrine of the Order, and is trying to hasten the rebirth of God in order to create Paradise. Claudia is driven by the belief that a God born of pain and suffering is more likely to create a merciful Paradise than a God that cannot comprehend empathy. The only clues concerning Claudia’s past arise during a cutscene, where Vincent Smith indicates that Claudia was abused by her father, Leonard Wolf. Leonard had raised Claudia as a strong believer in the cult’s faith, and it is implied that he inflicted physical punishment upon her for any irreligious behavior she had done. This, in turn, resulted in Claudia bearing a strong hatred for her father. It can be speculated that her desire to create Paradise is the product of an abusive childhood. As a child, Claudia was raised alongside Alessa Gillespie, Heather Mason’s original incarnation. As such, she sees Alessa as a sister and refers to Heather by her past name. Claudia’s mission is to succeed where Dahlia Gillespie failed in Silent Hill, impregnating Heather with God and hastening its “birth”. Claudia also holds a grudge against Harry Mason, the main protagonist from the first game who averted God’s birth the first time and kept “Alessa” hidden away. Claudia celebrating the arrival of God.Aglaophotis she has been carrying (hidden inside the necklace Harry gave her) and vomits the demonic, worm-like fetus back up. Horrified, Claudia immediately shoves Heather aside and swallows the fetus herself. Because Claudia was not meant to birth God, she endures an excruciating death as she staggers into a trapdoor in the floor. Valtiel pulls Claudia’s body into the basement where the final boss awaits. The cutscene before the God battle shows that all that’s left of Claudia is her dress. “	Alessa, my dearest… For the pain that I’ve caused you… I deserve no mercy. Even if it was to save mankind, it was too deep a sin. Much like Dahlia Gillespie from Silent Hill, Claudia speaks in religious riddles and holds an overwhelming belief in God. However, while Dahlia’s motives were decidedly malevolent, Claudia truly believes in what she is doing. While her faith is unshakable, Claudia realizes that her methods are questionable, and even states that she does not expect to take part in Paradise due to her role in Harry’s death. Claudia’s intention is to remake the present world into Paradise by reviving God. Because of her experiences during her childhood, she perceives the world as being full of suffering and in order to “save everyone,” she attempts to create paradise. She believes that for everyone to be saved, some sacrifices like Harry and Vincent are unavoidable. Because of her passionate need to believe, Claudia also has a temper, especially when others seem skeptical or opposed to her mission. She has several moments where she loses composure, particularly with Father Vincent, who openly mocks her faith. Eventually, Vincent’s words are met with violent consequences when Claudia stabs and kills him. According to Heather, if she were to examine the cards in Alessa’s room, Claudia often cried if she lost in card games to Alessa. While Team Silent considered many different character designs for Claudia, they ultimately decided on a simpler, more subtle character than they initially intended. Claudia was modelled to look like Julianne Moore. Team Silent purposefully neglected to give her eyebrows to make it hard to interpret her facial expressions, believing it would give her an unsettling appearance. Claudia wears simple, plain black robes and does not wear shoes. It seems that being barefoot is a tradition in the Order’s priestesses as Dahlia Gillespie did not wear shoes either and was barefooted in game. In the library, Vincent mentions that Claudia and Heather both have “special powers”. The Book of Lost Memories states that the reason Heather encounters the monsters in the shopping mall is because Claudia’s presence is nearby. The scene where Douglas points his gun at Claudia ends on a cliffhanger. When Heather reunites with Douglas, his leg is suddenly broken and he never states the cause of it. Because Douglas is in the same area and there are no monsters present in either cutscene, it can be assumed that Claudia used her powers to break Douglas’ leg through telekinesis. It is unknown where Claudia received her special powers. It is possible that like Alessa, Claudia had been born with unexplained special powers. It is also possible that playing with Alessa frequently throughout her childhood caused powers to manifest within herself. Lastly, the powers could also be a result of her strong faith within the Order given to her by the spiritual power of the land. It is seen that other members of the Order both revere and fear her due to her powers. “	Only we who hearken to the voice of God will be given the keys to Paradise! Leonard Wolf is the abusive father of Claudia Wolf and a former member of the Order. He was condemned to a mental hospital for his insane and abusive behavior, and stripped of his rank. However in his heart, he still held the teachings of the Order close, with fanatical devotion and even died because of this devotion. Leonard Wolf also appears in Silent Hill: Revelation. He will be played by Malcolm McDowell, who has described him as a man with no eyes who is trapped in a jail cell. Heather Mason encounters him in Brookhaven Hospital to acquire an artifact she and Vincent Smith believe can prevent the birth of “God”, the Seal of Metatron. He calls a phone in the hospital for reasons unknown, and Heather answers. Not knowing of his connection to the Order, Heather and Leonard find a mutual dislike of Claudia, who he thinks is a fool. When she later encounters him in the flooded basement of the hospital, she has another short discussion with him, during which Leonard is hidden from view. Heather is dismayed to find that he too is a follower of the Order. Leonard refuses to part with his treasure, believing it his duty to protect the seal. He rises from the water and reveals himself to be a grisly monster, forcing an exasperated Heather to kill him. Leonard appears almost reptilian in nature, with a coat of sickly, yellowed skin covering him (almost like the victim of a drowning). His face is mutated and marred beyond recognition, only having a series of holes where his face should be. His hands, his most prominent feature, are a pair of huge blade-like bone growths which he uses to swipe at Heather. He is amphibious as he can last almost indefinitely underwater. It is not clear what Leonard’s condition is. He may be a normal human who Heather sees as a monster. Another theory is that he was corrupted by his own madness and the Otherworld, and so became a monster representing his abusive nature towards Claudia. He also may have died, and his soul reformed as a monster in the Otherworld. Regardless, Heather notes that he is not a ‘person’ anymore before killing him. Leonard is quite aggressive; however, he spends much of the battle submerged underwater, crawling about out of Heather’s attack reach. He can nip at her ankles while he’s down there, but does no real damage. When he rises, however, he flails his blades about, able to do a great deal of damage to Heather in the process. He can also march towards her and slash at her, a problem compounded by the small fighting space. He is very vulnerable to firearms, however the maul also works well. As Leonard is quite slow while standing, the player can sneak behind him fairly easily. An overhead smash with the maul from behind stuns the boss, momentarily forcing him down, making it possible to score up to four consecutive hits. The boss battle with him is more a matter of patience and caution. In the Otherworld version of the Brookhaven Hospital, an optional memo can be found that contains a diary entry apparently written by Leonard. It is covered with childish doodles depicting a figure wielding dual daggers, a winged Sun (possibly representative of the Order’s deity) and the bodies of the slain strewn about the ground. It gives the player an early clue as to Leonard’s true nature and his belief that non-believers do not deserve salvation. It is also possible that the diary was written by Claudia as a young girl, though the notebook’s origins are unknown. The world is teeming with unnecessary people. It is God’s decision that I fight. As a knight of honor, as a protector of the seal, I sacrifice myself to the blood of criminals.